The SOLIDWORKS World Top Ten List is now open for voting! For those of you who are new to the SOLIDWORKS World Top Ten List, it is an opportunity to submit your ideas for enhancements to SOLIDWORKS. Now that the ideas submission is over, you have the opportunity to vote for your favorite ideas. All ideas are considered by SOLIDWORKS development and the Top Ten ideas will be presented at SOLIDWORKS World 2018 in Los Angeles, February 4-7. Submitted ideas can be viewed by visiting the SOLIDWORKS World 2018 Top Ten List area of the discussion forum. Click on the Categories on the side to sort by specific areas of SOLIDWORKS (Assemblies, Drawings, Simulation, etc.). 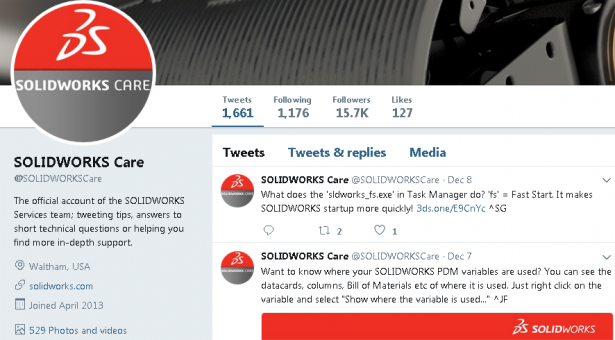 Did you know that for the past four years, the @SOLIDWORKSCare Twitter account of the SOLIDWORKS Services team has been feeding the SOLIDWORKS community with daily technical tips, news and links to useful SOLIDWORKS resources? The @SOLIDWORKSCare team consists of Genevieve, James, Anurag, Simon and Tony, all of whom work in the Technical Support organization. Their tips draw upon the collective experience of the Technical Support organization across the entire range of SOLIDWORKS applications. No doubt you’ll find some useful nuggets of information! So, if you’ve got a Twitter account please follow @SOLIDWORKSCare. If you haven’t got one, maybe it’s a reason to get one! One point to note is that we aren’t able to offer technical support via Twitter, so please use your SOLIDWORKS Value Added Reseller (VAR) for that, or drop by the forums here to ask for help or guidance from the rest of the community. Last month, Reza discussed the topic of Reports. This month, Reza comes back to talk about Buckling analysis. Next month, Yannick will give an Introduction to Fatigue analysis. Why does SOLIDWORKS® freeze on the VBA splash screen with the error ‘R6025’? This behavior is linked to Microsoft® Update KB4048955. To prevent this issue, uninstall Microsoft Update KB4048955. How do I use the SOLIDWORKS® Settings Administrator tool to prevent a user from creating mirror views in a drawing? Effective with the release of SOLIDWORKS® 2018, you can use the SOLIDWORKS® Settings Administrator tool to ‘Apply’ or ‘Lock’ the creation of mirror views in a drawing. To learn how to do it, follow the steps in Solution Id: S-073568. In SOLIDWORKS® 2018, how do I back up individual Hole Wizard settings quickly and easily?? Effective with the release of SOLIDWORKS® 2018 it is possible to use the Microsoft Excel® import and export functionality. To learn how to do it, follow the steps in Solution Id: S-073698. Where can I get the latest installation information for SOLIDWORKS® Manage 2018 SP0 and SP1? How can I see greater precision for the data values of a SOLIDWORKS® Simulation Response Graph? For more information, see Solution Id: S-073711.